Most modern-day racehorses are Thoroughbreds. The name accurately describes this breed of horse: they all have been very thoroughly bred. Thoroughbreds today can be traced back to three stallions, known as the Byerly Turk, the Darley Arabian and the Godolphin Arabian, which were imported to Great Britain from the Middle East and Turkey between the years 1689 and 1729. These horses were mated with strong English ones and the result was the Thoroughbred, properly called an English running horse. Thoroughbreds weigh less than many other breeds of horse and stand out because of their delicate heads, trim bodies, strong chests and relatively short backs. They are also known for being rather high-strung. Most attractive about the Thoroughbred is its ability to run rapidly over long distances. It can maintain a pace of 40 miles per hour for over a mile, a combination of speed and endurance that is unmatched in the animal world. The specially-bred horse has become synonymous with racing. Thoroughbreds are also used in other horse sports such as the steeplechase and polo. The first Thoroughbred to reach America, a stallion named Bulle Rock, arrived in 1730. Over the following 45 years, 186 Thoroughbreds would be exported from England to the American colonies, forming the foundation of the Thoroughbred family tree that American horse owners have bred ever since. In England, the United States and other countries, horse buyers and sellers keep careful records of each horse’s lineage. The family trees of many horses racing today can be traced in the British stud book, first published in 1791, which charts the genealogy of Thoroughbred horses. Stud records in the United States were begun in 1868. Today, the U.S. is the world center of Thoroughbred racing and breeding, with about 55,000 foals registered every year. Thoroughbreds’ racetrack earnings can be matched, if not surpassed, by the money they earn as the sires and dames of future stars. Horse breeders pay stud fees, which can run in the hundreds of thousands of dollars, for the privilege of mating their female horses with particularly fast or well-bred male racehorses. Owners hope that the coupling will produce a champion, who will one day become the source of still more champions. Horse buyers usually pay more for male horses, called stallions, than for females, called mares, because stallions can mate with a few dozen mares a year, while mares can only give birth to one foal per year. In 1918, horse owner Samuel Doyle Riddle paid an average price of $5,000 for a big, red yearling colt named Man o’ War. That five grand might have been the best bargain ever for a horse. 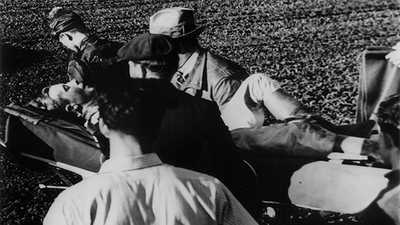 After his brief but legendary racing days were over in 1920, the stallion was packed off to Faraway Farm in Lexington, Kentucky, to become a father, again and again and again. Man o’ War sired 61 stakes winners, including American Flag, Crusader, War Relic, Mars, Clyde Van Dusen, and Seabiscuit’s rival War Admiral. The price that a horse earns in stud fees has as much to do with the success of its offspring as its own racing career. Breeders at first rejected Hard Tack, Seabiscuit’s sire, as a stallion. Then, when Seabiscuit began to win, the stud fee went up to a solid $250. 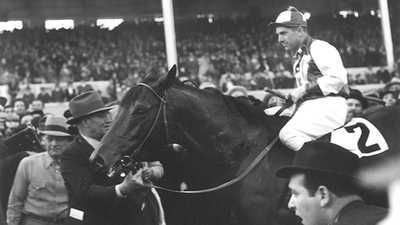 After Seabiscuit took the East by storm in 1937, winning race after race, Hard Tack’s amorous engagements earned his owners about $500. When Seabiscuit was named as a challenger to War Admiral, Hard Tack’s owners were paid $1,000 for a successful mating, as much as many of the top sires of the day were earning. In the 1960s, horse breeders organized themselves into syndicates — groups of people who bought shares in a horse. A syndicate purchased 2000 Kentucky Derby winner Fusaichi Pegasus for a record-breaking price of over $60 million when the stallion was three, after his two-year racing career was over. If he lives to be 25, the average lifespan of a Thoroughbred, Fusaichi Pegasus will sire hundreds of offspring. With a stud fee of around $200,000, the stallion’s syndicate stands to make a bundle. 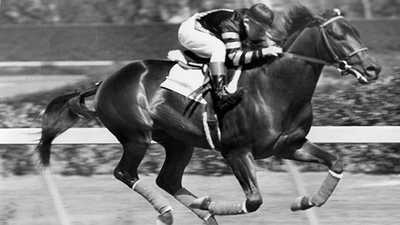 For as much attention as Seabiscuit received, the horse was not considered the fastest for most of his career. That distinction went to War Admiral.